I am sure that we would all agree that it is the EFFECT THAT IS ALL IMPORTANT and that some of the most astounding effects in card magic can be obtained by setting up the cards in a certain order before the performance commences. 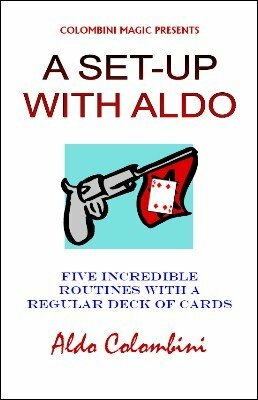 Here are five routines of Aldo which depend on set-ups. CRAZY POKER: The wildest Poker demonstration ever. KNOCK-OUT SPELL: Spelling procedures reveal incredible coincidences. ROYAL CUTS: The four Kings and the four Aces are produced in a surprising manner. JUNGLE JAM: A spectator cuts off a portion of a deck. The next two cards are dealt face up and their values are used to reach two more cards. At the end of all these procedures the four Aces are produced! DARK DRIVERS: A series of bewildering coincidences!